Living organisms, ecosystems, human minds, societies, economic markets are widely recognized as extraordinary complex systems. They are impressively organized and possess properties that are hardly reducible to qualities of physical matter. Thereby they seem to contradict the reductionistic paradigm of fundamental causation from underlying physical processes. As yet, satisfying explanation of emerging coherent organization is a comparable challenge for reductionist and holistic philosophies (Capra and Luisi 2014; Heylighen et al. 2007). Even if the reductionist approach continues to deliver outstanding results in physics, chemistry, molecular biology, neuropsychology, much deeper understanding of living (Schrödinger 1944; Murphy and O’Neil 1995) and conscious (Kim 1998; Varela et al. 1991) agencies may require an uneasy paradigm change, after all. I introduce a concept that can simplify and unify analysis of intricate causal relations in complex systems to a remarkable extent. This concept of delegated causality should clarify much about emergence of whole new phenomena (Clayton and Davies 2006), spontaneous order (Kauffman 1993), synergy (Corning 2005), functionality (Ariew et al. 2002), purpose and intention (Dennett 1987). If the new conception indeed refines established specialist perspectives, it will be worth revisiting sporadic revivals of Emergentism (Clayton and Davies 2006, pp. 9–26), post-Enlightenment rationalist skepticism (Clayton and Davies 2006, pp. 114), classical Greek teleologies (Ariew et al. 2002, pp. 7–30). The most rigorous contemporary relevance of the new perspective is to physics of emergence (Mainwood 2006), symmetry breaking (Anderson 1972; Moon and LaRock 2017), thermodynamics (Prigogine and Nicolis 1977; England 2013), and to information-theoretic measure of causal influence (Hoel 2017; Tononi and Sporns 2003). A comprehensive overview of the vast, growing literature on complex systems, self-organization, emergence would not serve the purpose of this article to introduce delegated causality. This simple but subtle, overlooked kind of causality is anticipated or provoked (figuratively speaking) by critical dynamical systems with rich behavior and moderate sensitivity to the environment. The scope of my abstracted terminology will become clear with the introduction of methodology [M1]–[M3] in Sect. 3 of analyzing causal interactions. Evident implications of delegated causality will be demonstrated by a brief account of evolutionary biology (in Sect. 5) and a reference to Chinese philosophy (in Sect. 6). This spirited article would be presentable to a scientific version of the TV show “The X-Factor” (Hackley et al. 2012). My argumentation is not deep formally, as the chief purpose is to justify the new concept by a few evocative arguments, agreeable examples, and links to existing ideas. This manner of aboutness (Yablo 2014) mirrors the general view of self-organization conveyed here. I start by reassessing contemporary modeling of complex systems in Sect. 2. The fresh kind of causality is introduced formally in Sect. 3. Section 4 examines physical reductionism in the new light, and relates emergence, downward causation to Gödel’s (1931) incompleteness theorem. The later sections deliberate a few compelling (though not entirely comfortable) implications. All together, this article is gradually making a holistic argument for a new comprehensive view by building up the context for the integrating Sect. 7. Natural complex systems are studied under many frameworks: self-organization (Ashby 1962; Depew and Weber 1999), complex adaptive systems (Miller and Page 2007; Horgan 1995), autopoiesis (Maturana and Varela 1980), dissipative structures (Prigogine and Nicolis 1977), self-organized criticality (Bak 1996; Watkins et al. 2015), etc. The models are often based on non-linear dynamical systems, their attractors, non-equilibrium thermodynamics (England 2013; Kondepudi et al. 2015), phase transitions (Brochini et al. 2016), scaling analysis (West 2017), cellular automata (Wolfram 2002; Langton 1990), variation and selection mechanisms (Heylighen 2000; Vijver et al. 1998), systems theory (von Bertalanffy 1968; Capra and Luisi 2014), developmental frameworks (Salthe 1993; Coffman 2011), information dynamics (Lerner 2007). Phenomenology at the center of attention includes spontaneous increase of order (Holland 1995; Kauffman 1993), emergence of coherent global behaviors from local interactions (Popkin 2016), adaptation to environment perturbations. de Wolf and Holvoet (2005) put forward applicable distinction between self-organization and emergence. Autonomy, decentralized control, interactive closure are often among defining features of complex systems (Maturana and Varela 1980; Moreno and Mossio 2015). But the autonomy assumption should not be idealized, especially when considering causation in actual complex phenomena. Reflections in this article suggest that behaviors (of constituting agents or the whole system) which amount to control sharing or transfer can be very far reaching. General heterogeneous adaptive systems are mainly organized in a hierarchal way as outlined by Simon (1962). Intense, diverse interactivity between levels facilitates growth and adaptation. Let P denote the spectral corner representing these systems. Let Q denote the opposite spectral corner in Fig. 1. Do we find phase transitions of homogeneous matter there? Their unfolding depends on a few macro-parameters such as temperature, and the environment influences them once it is included in a model. Similarly, chaotic dynamical systems are highly sensitive to perturbations. Hence deviations from deterministic trajectories are inevitable once a bit of environment exists. Dynamics with a finite time singularity (Johansen and Sornette 2001) will inevitably change before the singularity. Exponentially growing dynamics are likely to meet boundary limitations as well. Are there deep causal implications of this practically unavoidable environmental influence, particularly when the system happens to be fine-tuned to be influenced? Does this perceptive condition allow genuine downward causation from emergent entities? At least, can these queries be resolved for emergent phenomena near the corner Q, where reduction to basic physical causes seems to be assured? This article starts to address these questions. Physical reduction is practically ineffectual near the corner P. The renowned biologist Mayr (2004, Ch. 4) writes : “the physiochemical approach is totally sterile in evolutionary biology”, and “analysis is continued downward only as long as it yields useful new information”. Furthermore, Mayr cites Popper’s (1974, pp. 269, 281) harsh critique: “as a philosophy, reductionism is a failure ... we live in a universe of emergent novelty; of a novelty which, as a rule, is not completely reducible to any of the preceding stages.” If physical reductionism is tenable after all, it is extremely deeply masked near the corner P. I reckon that this masking is done by layers of delegated causality. We affirm our focus by the following three definitions. They suggest a non-reductive perspective where the focus is on potential interactions between dynamical processes rather than mathematical behavior of a single dynamical model. The first definition characterizes those (continuous or discrete) dynamical systems or their equilibria, bifurcations, critical phases, “edge of chaos” conditions (Waldrop 1993; Kauffman 1993) that are “waiting to be perturbed”, figuratively speaking. A dynamical system (or its state) is primed if it can exhibit complex, potentially utilitarian behaviors depending on moderate adjustment of boundary conditions. This definition may seem unsatisfactory because of several subjective terms. However, the hint of subjectivity and external references are important features of the definition. Primed dynamical systems are to be considered not in isolation but under influence from each other and the environment. They passively, reactively follow the laws of physics, boundary conditions, perturbations. Most dynamical systems can be considered as primed if potential interactions with other systems are sufficiently interesting. Definite examples of non-primed systems would be chaotic systems or those in a thermodynamic equilibrium. Once feedback loops between intricate reactions and triggers of various primed systems materialize, an elaborate cybernetic or evolutionary system may come out. Let us use an economic metaphor for the full spectrum of relative, relational configurations of this kind. A broad market is a set of primed dynamical systems, triggering influences and potential reactions between them. Extending the economic metaphor, we may refer to sensitivities of a primed dynamical system as its demand, and to the driving effect as supply. A broad market may be structured into hierarchical (Simon 1962; Salthe 2012) or cybernetic modules, or dominated by an exchange regime of that supply and demand. The causal relation between a primed dynamical system and an external, emergent or self-organized influence that drives the dynamical system by a moderate force of interaction is called delegated causation. The “moderate force” here is defined in the capability context of driving influences. Their dynamic realization is beside the main point. Just as operative features of supply are fairly unimportant in marketing and commerce, the causal relation is not defined by the substance of influence factors. I discuss possible dynamic nature of driving influences at the end of Sect. 6. These definitions make most sense for complex systems near the spectral corner P in Fig. 1. Emergent wonders near the corner Q may play special roles in broad markets, as we can recognize them in computer hardware, inside smartphone screens. But the meaning of cause delegation within their internal homogeneous “markets” requires further interpretation, as I briefly discuss in the next section. Identify the primed dynamical system in the interaction. Determine its sensitivity to perturbations, and possible reactions to perturbations. Identify the perturbing influences; describe their mechanism. Describe the context, the broad market of the interaction. This methodology is illustrated in Sect. 5 by series of biological examples. The factor [M2] can be identified as an interventional cause. I view [M1] and [M2] as a dual pair of delegated and interventional causations. In the common language, “delegation” describes plausibly the cases when [M1] is strong, while “intervention” describes the cases when [M2] dominates. I use the language of delegation in the abstract and general sense of the causal factor [M1] in any interaction. Layers of delegated causality signify systems with great dynamical depth (Deacon and Koutroufinis 2014). Measures of Kolmogorovian sophistication (Mota et al. 2013) are promising for quantifying system complexity. My perspective recommends perturbative analysis of dynamical systems and complexity measures, because significance of primed systems lies in their interactive potential. Delegated causality amounts to a significant case of Deacon’s (2011) specific absence as a “pulling” causal force (see also Clayton and Davies 2006, p. 119). Causal roles of constrained absences, virtual demands, “pregnant” (Salthe 2012, section 9) opportunities merit good appreciation. For example, early stages of the British industrial revolution were much stimulated by specific needs of textile, iron, and mining industries (Deane 1979). On the other hand, dynamical laws and initial conditions enjoy the respectful status of causes. But chaotic dynamics and causality delegation undermine that status. If an attractor, an equilibrium, or a self-organized state is reached regardless of initial conditions, what is exactly a cause? Openness of delegated causality conforms well with Pearl’s (2000) empirical analysis of causation in terms of interventions and counterfactuals. Interventions are “actions as external entities, originating from outside our theory, not as a mode of behavior within the theory” (Pearl 1999). Causative interventions on primed dynamical systems (and possible malfunctions as reverse interventions) must be pivotal features of complex systems. My first weighty thesis is this: delegated causation offers a conceptual mechanism how micro-scale dynamics results in empirical causation from macro-level agencies in terms of Pearl’s (2000) causal calculus and Hoel’s (2017) causal emergence. Here is one rationale formulated in the economic terminology: complex events are better temporally correlated with appearance of supply rather than with an onset of demand, commonly. A row of falling dominos can be interpreted as a prototypical example. It would be instructive to relate sensitivities of micro-level dynamics and effective information (Hoel 2017) measures in a compelling example of a “smoothly” emergent phenomenon. As a mechanism of downward causation, delegated causality often entails environmental influence. Other proposed mechanism of downward causation via environmental interaction is practopoietic cycle (Nicolić 2015, section 2.6). My second weighty thesis refers to Gödel’s (1931) incompleteness theorem. Delegated causality has a self-contradictory flavor of a Gödelian paradox (Humphries 1979) in the causality language. This messes up basic principles for physicalism (Kim 2005), and Kim’s (1998) argument against non-reductive physicalism. In particular, the causal closure principle says that if a physical event has a cause, it has a physical cause (Clayton and Davies 2006, p. 199), and the exclusion principle states that no single event can have two independent sufficient causes (Kim 2005, p. 41). Kim’s conclusion is that non-physical (say, mental) events can have no causal power. In contrast, delegated causality provokes causal, informational contribution from external agents or from an emerging organization, even if delegation is not ideal. Sufficiency of physical causation is debatable then. Delegated causality clarifies inevitability of causal parity (Weber 2018) and levels of explanation. It furnishes hierarchical dynamics, which in turn reinvigorates Aristotle’s four categories of material, formal, efficient and final causes (Coffman 2011; Salthe 2012, section 9). Incidentally, Popper (1974) invoked Gödel’s theorem in his argument against reductionism. By a similar reference to Gödel’s incompleteness, Rosen (1991) repudiated theoretic formalization of life. Kim’s epiphenomenal implications have been countered by interventional (Shapiro and Sober 2007) and counterfactual (List and Menzies 2009) argumentation. Causality and reduction in emergent phenomena are customarily analyzed in terms of supervenience (Butterfield 2012; Stalnaker 1996; Clayton and Davies 2006, pp. 189–243): the principle that entities with the same micro-level properties will have the same macro-level properties. A supervenience is often defined by a coarse-graining map from physical micro-states to emergent macro-level states. Delegated causality amounts to engaging external information, possibly entailing an externalist (Clark and Chalmers 1999; Menary 2010) propensity to expand the supervenience base of micro-states beyond memorization, representation. This propensity can be quickly consummated in complex systems near the corner P, making a supervenience analysis doubtful. For example, an animal may habitually follow certain external clues, peer group behavior or “expert” guidance. Or the neuro-physiological basis of its behavior might be “eagerly” changing in live action. These are examples of situated, embodied cognition (Wilson 2002). Human consciousness and free will are the most prominent emergent phenomena. Without more ado, they could be viewed as pinnacles of delegated causation in the known cosmos. From a utilitarian perspective, consciousness is a cognitive-behavioral characteristic that is able to intervene on (sometimes particularly quiet) emotional, somatic drivers. Can emergent systems near the corner Q in Fig. 1 be interpreted as “eagerly” seeking outside influence, even if the outside is presumably negligible? In a sense, phase transitions delegate causality to dust particles, matter irregularities. Most dramatically, we can consider the whole Universe with no outside in principle. Can we then speculate that a collective behavior of the system is seeking to externalize its statistical parameters, thermodynamic “forces” (Onsager 1931), thereby meeting Mach’s principle (Jannes and Volovik 2015), renormalization group dynamics (Batterman 2000; Mainwood 2006, Ch. 3), Heisenberg’s indeterminacy, or an observer at the “boundary”? Can dynamic novelty be a valid extension of a supervenience basis? Does emergence itself reflect primordial ways of conceding causality? At least, these speculations could be simulated by a chaotic, fractal or hardly computable topology of the supervenience map, while the macro-dynamics would be described by smooth functions. The consideration of emergence as delegated causality is supported by the recently established correspondence between the renormalization group in theoretical physics and the deep learning approach in artificial intelligence (Wolchover 2014; Mehta and Schwab 2014); I elaborate this in Sect. 7. The above questions ought to be addressed by theories of everything (Hawking 2005). Delegated causality gives an apparent taste of physical implications of Gödel’s incompleteness theorem (Jaki 1966; Dyson 2004; Hawking 2002). It may even turn out to be a reformulation of Gödel’s incompleteness in causal terms. The notion of delegated causality enhances rather than renounces the reductionist paradigm by defining the causal role of critical, “edge of chaos” systems. Possibilities of extravagant dynamics are wholly controlled by micro-level arrangements. But dynamical actualization is contingent to particular instabilities or input from the environment. Biology is a great ground for testing explanatory power of delegated causality. We can expect lots of elaborate causative interventions, provocations. Mayr’s (1961) influential article distinguishes proximate (mainly physiological) and ultimate (mainly evolutionary) causes of biological phenomena. Contrary to the reductionist template, the relatively more “teleological” level of explanation by natural selection and adaptation is considered more fundamental in the conventional (neo-Darwinian) Modern Synthesis. Physiological development is guided by the genetic code, which in turn is pressured by natural selection. By a rigid interpretation of Modern Synthesis, biological functionality and organisms can be fully understood only from the evolutionary perspective, while comprehension of ontogenic development is principally unnecessary for that. This reduction of biological causes to statistical phenotype selection, genetic adaptation and drift could be a deep reason of steady critique of the Modern Synthesis (Laland et al. 2014; Welch 2017; Gould and Lewontin 1978; Pigliucci and Muller 2010; Vijver et al. 1998). Laland et al. (2011, 2013) suggest that Mayr's proximate-ultimate dichotomy, although still vital, hinders a proper integration of evolution and development, recognition of multiple sources of evolutionary novelty. They advocate an intimate relation between developmental and evolutionary processes, with the former able to influence evolutionary change through phenotypic plasticity, developmental bias, epigenetic inheritance, behavioral changes, and ecological interactions such as niche construction. This is a good list to test scientific productivity of the delegated causality notion. Genes are masters of causal intervention in the biological world, enjoying vast biochemical infrastructure. But they themselves may be open to interventions. Feedback from developmental and ecological conditions would be a powerful source of adaptation, with diversified agencies and information forms as inevitable effects. The methodology [M1]–[M3] in Sect. 3 of explicating delegated causation is helpful to highlight interventional forces [M2] and signification [M3] of interactions. This is illustrated in Table 1 by several physiological, ecological, evolutionary, biochemical (Monod 1972), and developmental (Fagotto 2014; Nieto et al. 2016) examples. In many cases, the dual force of intervention dominates. But the central role of genes is compellingly a cybernetic hub of delegation, as I recount again in the middle of Sect. 7. In the biochemical context, the columns [M1], [M2] delineate Rosen’s (1991) rendition of Aristotle’s material and efficient causes, respectively. Systemic closure of efficient causes is underscored by theories of biological autonomy (Moreno and Mossio 2015; Maturana and Varela 1980). In the context of causal stability and specificity (Calcott 2017; Woodward 2010), the factor [M1] tends to provide specificity, while [M2] furnishes stability and permissiveness. The analysis [M1]–[M3] must offer more clarity than the proposal in (Laland et al. 2011, 2013) to employ a terminology of reciprocal causation. The polarity between Mayr’s proximate and ultimate causes should rather stay. Other biological disciplines where explicit analysis of delegated causation ought to be useful are microbiology, symbiosis (Margulis and Fester 1991), communication (d’Ettorre and Hughes 2008). The contentious subjects of group selection (Wilson and Sober 1994), multilevel selection (Okasha 2006), evolvability (Crutchfield and Schuster 2003), cooperation (Nowak 2006), altruism (Sober and Wilson 1988), longer term adaptation might be greatly altered by the perspective of delegated causation as well. The criticized theory of Wynne-Edwards (1962) of territorial and hierarchical organizations in various species regulating population growth becomes more plausible, as game-theoretic explanations (Dawkins 1976, Ch. 7) turn into proximate causes relative to the “ultimate” adequacy between population size and resources. Mayr (2004, Ch. 8) acknowledges selection of cohesive social groups because their fitness values can be disproportionately larger than the mean values of individual fitness. This is reminiscent to the emergence principle that the whole is greater than the sum of its parts. Conceptions resonating with delegated causality can be found in Chinese philosophy. Provocation of some experiential apprehension from readers looks sensible or frankly unavoidable in this presentation. That being the case, this section could be excused for being a little rhetorical. Certain cultural, social parallels may be promptly triggered. Carefully evaluative readers are encouraged to contain social, emotional charges and judgements. The ancient Chinese concepts of Yin and Yang are customarily evoked to affirm complementarity of opposing, interdependent forces. It is less widely known that Yin and Yang are defined (Oxford 2010) as two concrete complementary principles. The complementary harmony is better underscored by Taoism (Capra 1975), while the particular duality is more emphasized by Confucianism (Rosenlee 2007). Recently, the Yin-Yang polarity has been interestingly related to holistic causality (Chung 2016), epistemology (Zhang and Zhang 2007; Benetatou 2016), transformational change (Klein and Wong 2012; Li et al. 2012), and even microbiology (Zhang 2014), molecular biology (Gordon et al. 2006). One of the defining complementarities is that Yin is an abstraction of passivity, inertness, while Yang is the active, generative principle. This particular duality captures the contrast between mechanical dynamical systems and emergent phenomena very well. A primed dynamical system of Definition 1 would be a passively reactive Yin, while any effective influence in Definition 3 would be Yang. It seems fittingly convenient to adopt this language. Paraphrasing an earlier statement, dynamic realization of Yang is beside the main point. Yang is the novelty, emergence beyond Yin’s territory. Relative to underlying Yin dynamics, Yang is a hero (Campbell 1968), a master, an artful trickster. Yang is the magic of actualizing synergetic possibilities. Yang “opposes” entropy increase by causative leadership, blocking unwelcome occurrences, forcing a decisive turn of action, claiming the language of communication. It is not necessary to assume supernatural causes to explain Yang manifestations. Yin’s ready anticipation of external perturbation and yielding to self-precipitated pressures are pulling causative forces already. Yang is defined by this anticipatory perception of Yin. We may refer to a finely triggered Yin’s incipient reaction as Yin’s satisfaction. In some cases, this satisfaction may be prompted straightforwardly; in other cases it may be an uncertain, rare event. Both Yin and Yang of a particular interaction may evolve to sophisticated cybernetic levels, meeting criteria of a broad market. For example, a perceptual mechanism is Yin primed to be affected by the environment. But Yang should have perceptual capabilities to recognize peer Yin’s dynamic demand and address it. The simplest mechanism of Yang (as external dynamics) is randomness. This means, Yin allows chance to direct its dynamics. For example, divination rituals were common in ancient human societies. In China of the Shang dynasty (circa 1600 BC–1046 BC), oracle bones of ox or turtle were prominently used (Keightley 1978). Other simple mechanism for Yang is competition. That is, Yin sets up a contest who best performs or fakes a particular demand. Another manifestation of Yang is information. Generally, Yang can be identified in processes that are called “teleological” now and then. It is instructive to inspect Mayr’s (2004, Ch. 3) classification of five teleologies: “four of the five phenomena traditionally called teleological can be completely explained by science, while the fifth one, cosmic teleology, does not exist.” The similar list of Ellis (2012; 2016, Ch. 4) of five downward causations is definitely germane as well. The two weighty theses in Sect. 4 relate delegated causality to emergence and Gödel’s incompleteness theorem. Emergence and Gödel’s theorem are brought together in the literature at times (Requardt 1991). For example, Jorgensen and Svirezhev (2004, p. 8) write : “In accordance with Gödel’s Theorem, the properties of order and emergence cannot be observed and acknowledged from within the system, but only by an outside observer.” It could be meaningful to consider emergent phenomena and selection modes as physical, biological, or socionomic (Prechter 2003) manifestations of Gödel’s incompleteness. Monod’s (1972, Ch. IV) concept of gratuity—i.e., independence between chemical qualities and function of biochemical processes—can be similarly related to Gödel’s theorem as well. Delegated causality facilitates hierarchical dynamics and defines Nature’s “joints” (Salthe 2012, section 4) along which dynamical levels are fused. Higher levels impose boundary conditions, constrains, selection regimes on dynamics of lower levels (Juarrero 1999). This downward causation is enabled by critical, primed organization of the lower levels. Intermediate “sub-wholes” in a dynamical hierarchy are Koestler’s (1978) holons—i.e., stable, integrated, largely autonomous, yet interactive entities. They are both primed dynamical systems and interventional forces, both consumers of energy and local sources of order. The constrains of a dynamical level define distinct dynamics, bias, functionality, and a “behavior code” of the holons. Recently (Mehta and Schwab 2014; Wolchover 2014), an equivalence between the renormalization technique in condensed matter physics and the deep learning approach in artificial intelligence was established. This reinforces the interpretation that micro-dynamics of a phase transition [or a dissipative system such as Bénard’s cells (Goldhirsch and Procaccia 1981; Swenson 1997, pp. 22–25)] is organizing itself to “explore” and adjust to macro-boundaries. The scale-free dynamics extends mean free-path distances and relaxation times of particle interactions by orders of magnitude, until limiting macro-dimensions are eventually met. Causality delegation becomes a paraphrase of this “deep learning” of macro-dimensions. This enriched metaphorical context echoes the Santiago school view of living systems as cognitive (Maturana and Varela 1980), sense making (Thompson 2007) systems, and Heylighen’s (2011) view of evolution and self-organization as cognitive processes. The action-centered ontology (Heylighen 2011) assigns intentional stance (Dennett 1987) to increasingly adaptive agents, and (in essence) recognizes interventions as basic constituents of reality. But the passive, incomplete kind of delegated causality should be recognized as well. Deacon’s (2011) cryptic notion of ententionality is relatable here, if it characterizes being organized for some functioning. Elements of anticipation relate primed dynamical systems, deep learning, and enactive (Varela et al. 1991, Ch. 8) cognition. The focus of anticipation defines the cognition aim or the significance, aboutness (Yablo 2014) of expected dynamical triggers. Primed dynamical systems and delegated causality ought to be discerned in all phenomena and entities that are considered emergent or self-organizing. For example, a living cell is predominantly a product of developmental processes that delegate their coordination to genes. Biochemical reactions in the cytoplasm are orchestrated by genes in the form of nucleic acids, but epigenetic switching, energy input from mitochondria, and nutrient flow determine the mode of metabolism. Arrangements of tissues and organs are coordinated by genes again, but the behavior and fate of organic “vehicles” (Dawkins 1976, section 12) are delegated to the nervous system, sociality, tribal customs, or eventually to democratic politics. Natural, symbiotic, artificial, and cultural selections blend into a rather continuous spectrum of efficient causes. Intuition on delegated causality can be further enhanced by reflecting on many regarded modes of economic causality (Hoover 2001; Morck and Yeung 2011; Varian 2016; Joffe 2017). Furthermore, it is worth to reflect on causality of avalanches in self-organized critical systems (Bak 1996; Watkins et al. 2015), where (in theory) only a scale-free statistical distribution has a predictive power. Scale-free dynamics in heterogeneous systems near the corner P in Fig. 1 can be self-reinforced by a few persistent motives of adaptation throughout the scale expanse. The Chinese concepts of Yin and Yang describe dynamical discontinuities fittingly. The interaction between Yang’s constraints and Yin’s demand or satisfaction should define a statistical partition for a relevant entropy tally, and the semantics of what is caused by delegation. 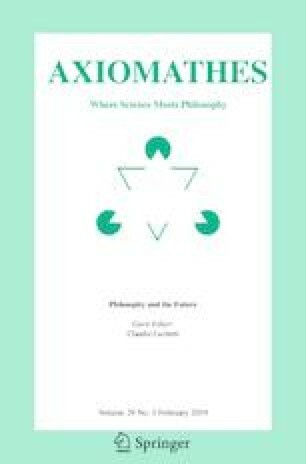 Yang’s contingency suggests that universal principles of self-organization or non-equilibrium thermodynamics [such as speculated laws of maximal entropy production (Swenson 1997)] would rather describe potentialities. Overwhelming interventions, catastrophes, dynamical collapses, black swans (Taleb 2007) fit the presented context of delegated causality as Yang forces. Resignation to them would not be called “delegation” in the common language. On the other hand, ignoring predictably unsustainable trends (even if the timing and operation of a likely resolution is highly uncertain) amounts to delegation of responsibilities for consequences. For example, human conscious effort to address a climate change (Zhang et al. 2011) is a potentially significant causal factor. Likelihood of a catastrophe indicates a primed dynamical system, to be influenced possibly by its constituents. The perspective of Yin and Yang applies to the cultural discord between conservative and post-modernist (Foucault 1980) views in the United States. As the American academic critic Bloom (1987, p. 25) noted, the post-modernist “relativity of truth is not a theoretical insight but a moral postulate”. Post-modernism can be viewed as celebration of Yin birthrights and subjective preferences, as well as denial of Yang authority. Firstly however, limitation of resources is not addressed operatively by the progressive optimism. That is left implicitly to social, political, or financial (Graeber 2011) hierarchies, be them patriarchal or not. Congruent resolution of oppression and sustaining social progress may continue to be historical challenges (Graeber 2011, p. 183), especially under a prolonged environmental stress. Secondly, Yang standards of leadership are yet appreciated by the progressive electorate. This is evident from the 2016 US presidential election (Reynolds 2017), where Hillary Clinton did not fully motivate her expected voters. Common experience, biology (Mayr 2004), empirical causality (Pearl 2000), information measures (Hoel 2017; Tononi and Sporns 2003) tell that downward causation apparently exist. The interpretation of the ancient Chinese concept of Yin as a primed dynamical system intimates that downward causation does exist in a very strong, virtually mechanical sense. Instead of having “higher scales wrest the controls from lower scales” (Wolchover 2017), the lower scales can be organized to operatively concede a good deal of causality to some higher scales. This possibility shifts the reductionistic paradigm in a novel way (Kuhn 1970). The duality of delegated and interventional causations is subtly eminent in Yin–Yang philosophy. Letting things go their way for a matched balance is a part of this duality. Co-evolution of agencies with expanding capabilities to provoke, perceive, impose causal relations can lead to understandably tremendous consequences. Conspicuously complex natural systems build up on interactions of delegated causality. This must be it. Open access funding provided by Max Planck Society. This article is influenced by informed experience of personal development since 2012. The understanding of Yin and Yang is inspired by works of David Deida, Adam Gilad, David Shade. The emphasis on causality sank in while listening to Jason Capital, Bobby Rio. For an introduction to externalist, interventional, mythological perspectives, thanks to Joseph Riggio. Constructive comments from Ari Belenkiy, Marianne Benetatou, James Read, Stanley Salthe, Susumu Tanabe, Alexander Tokmakov, and fruitful conversations with Yang-Hui He, Minxin Huang, Sanjaye Ramgoolam, George Shabat are much appreciated.